Why Do Bathrooms Require So Much Light? When it comes to deciding which rooms need lighting in your home, bathrooms may not be first on the list. However, they tend to require more strategic lighting than you would typically think of for such a small room. Why is this? • Are used for many different purposes. Often times, the smaller the room, the harder it is to light. Small bathrooms regularly lack windows or wide doorways that would otherwise let in natural light. Aside from their small size and cave-like characteristics, bathrooms are also used for many different purposes, which make them difficult, yet extremely important to light properly. Bathrooms are used for getting ready in the morning, doing ones hair, getting dressed and applying makeup. You may be able to get away with minimal lighting some of those tasks every once in awhile, but when it comes to applying makeup, lighting is vital. 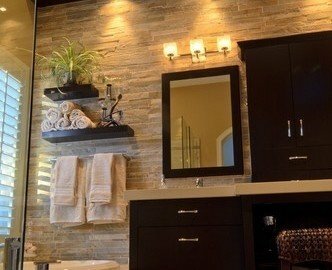 Vanity lighting and wall sconces are two of the most common types of lighting fixtures for a bathroom. Lighting is all about layers, and the bathroom is no different. Start with vanity lighting or wall sconces to bring in light at eye level. Next, you’ll want to add overhead lighting to light up the room as a whole. You can do this with recessed lighting, track lighting, or a chandelier. Not sure your bathroom will always need that overhead lighting? Make sure it is on a dimmer so that you are always in control. By lighting your bathroom from different heights, you’ll create layers of light that are perfect for this type of space. When it comes to your bathroom, it is better to have the option of always adding more light than not having enough. You’ll be thankful for your layers of light next time you are trying to get ready in the dark during an early winter morning.